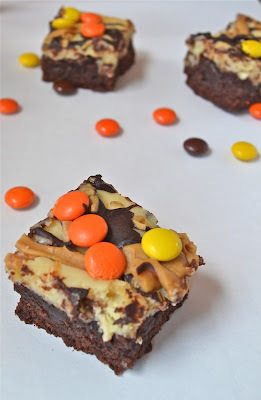 My fiancé Billy absolutely loves anything Reese’s, especially Reese’s Pieces, so when I came across the recipe for these Ultimate Reese’s Cheesecake Brownies over at Brucrew Life, I knew I’d have to make them for his birthday. These really are the “ultimate” Reese’s fan’s dream come true. They are loaded with chocolate and peanut butter and are so incredibly decadent. The cheesecake layer is just another added bonus and really adds a whole other dimension to these already amazing treats. Another great part to these Ultimate Reese’s Cheesecake Brownies is how easy they were! It really isn’t much more complicated than making regular old brownies so even a rookie baker would have a hard time messing these up! 1. Preheat oven to 350 degrees and line or spray a 9×13 pan. Mix brownies according to package and pour into the pan. Set aside. 2. In a medium bowl, beat cream cheese, butter and cornstarch until fluffy. Beat in condensed milk, egg and vanilla until smooth. Stir in the chopped Reese’s cups. 3. Evenly distribute the cheesecake batter on top of the brownie batter by spooning it in. Bake for 40-45 minutes and cool on a wire rack. 4. Cut into bars and drizzle with the melted chocolate and peanut butter. Sprinkle your Reese’s Pieces on top. Refrigerate.